Dominique & Cindy Duby are the chefs, chocolate-makers and designer chocolatiers at Wild Sweets®. When their hands are not covered in chocolate, the Dubys also design, style, and shoot all the Wild Sweets® photography — from product packaging to website images, as well as FoodArt concepts. They test novel ideas in their Cocoa-Science R&D research lab located in Richmond, BC and write award-winning cookbooks. Linda Mitsui is an award winning graphic designer with over 25 years of experience, most of them as the owner of her own graphic design firm — Profile Design Group. At Wild Sweets®, Linda is in charge of all graphic design tasks, including product packaging, marketing material as well as other art-based tasks such as design and sculpting of cocoArt mould masters, computer-based chocolate showpiece designers, and more. Dominique & Cindy Duby — Managers and Members of Pastry Team Canada — collaborated with Linda Mitsui over many months to design their complete showpiece program for the 2003 Coupe du Monde de la Patisserie in Lyon, France using 3 different mediums: chocolate, sugar, and ice — all based on the theme of “Performing Art”. Wild Sweets Chocolate, from the Atelier of Dominique & Cindy Duby and with a foreword by Charlie Trotter, won the title of Best Chocolate Cookbook in the World at the 2007 Gourmand World Cookbook Awards, in London England. Dominique & Cindy Duby took charge of the recipes, styling, and photography for this 208-page full-colour cookbook project, while Linda Mitsui edited the photography and designed the book. The Wild Sweets® creative team has a passion for food, photography, design and call on these passions to create unique artwork. For this project, special canvases were created to decorate an 18 x 8 foot wall in the Wild Sweets® Atelier. For the photography, the Dubys used various tools and food science ingredients to manipulate the chocolate and sugar mediums and used special lighting techniques to create unique micro-food compositions, while Linda Mitsui photo-manipulated the images to bring the colours into a primary state. Wild Sweets® By Dominique & Cindy Duby is ranked one of the ‘25 Best Chocolatiers in the World’. The ranking is part of ‘Chocolate - The Reference Standard: The Chocolate Tester’, released by Georg Bernardini. The comprehensive resource book reviewed and taste-tested over 550 brands and 4,000 products from 70 countries. The ranking is based on various stringent evaluation criteria and awards 0 to 6 ‘Cocoa Pods’ – similarly to the ‘Stars’ that the Michelin Guide awards to restaurants internationally. Additionally, products and brands that score the highest ranking, or 6 ‘Cocoa Pods’, are included in the ‘List of the Best’, which in this year edition included only 25 companies worldwide. Wild Sweets was awarded the coveted ‘6 Cocoa Pods’ and ranked as one of the ‘25 Best Chocolatier in the World’ alongside other international chocolate luminaries such as Pierre Marcolini in Belgium, Patrick Roger in France, Es Koyama in Japan, Michael Recchiuti & William Dean in the USA to name but a few! 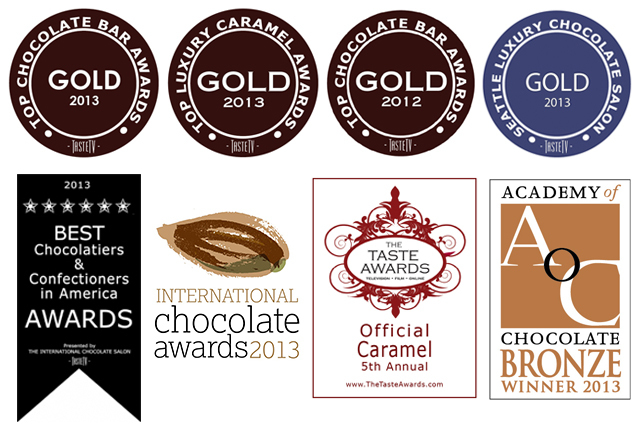 Wild Sweets® By Dominique & Cindy Duby are proud recipients and winners of 'Best Chocolatiers & Confectioners in America Awards' (2013 to 2018) from The International Chocolate Salon, an organization based in San Francisco, USA. The Best Chocolatiers & Confectioners in America Awards winners are based on the combined total number of Gold and Silver Awards received by each entrant in each year Chocolate Salon Competitions in San Francisco, Los Angeles, Seattle, and/or standalone Chocolate Salon Award Competitions for Best Caramels, Toffees, Bars, Truffles and/or Artistic chocolates. Dominique and Cindy Duby are longtime internationally acclaimed award-winning pastry chefs / chocolatiers and world experts in their field. 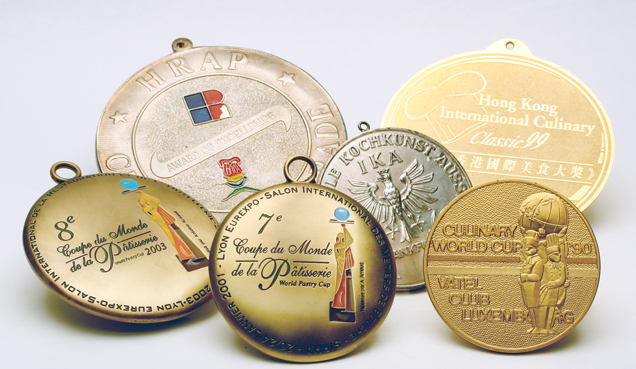 The Dubys won many gold and silver medals in world food art competitions (North America, Europe and Asia) such as the IKA World Culinary Olympics in Germany and Culinary World Cup in Luxembourg. Dubbed Canada’s most notable sweet chefs, they represented and led Pastry Team Canada several times in the world’s most prestigious team pastry events including the World Pastry Cup in Lyon, France. And their exploits have been captured in documentaries featured on the Food Network TV. For the last 10 years, Dominique and Cindy Duby have worked closely with the University of British Columbia to create the next cutting-edge sweet food innovation. Pioneers in the Molecular Gastronomy movement, the Duby’s were the first sweet chefs to introduce the concept in Canada in the early 2000s. Science continues to be a big part of their approach to food design, which they now call Culinary Constructivism and they continue to lead the way as Canada’s only science-based chocolate-makers. The Dubys are regular contributors of trade articles on their cutting edge sweet food innovation in international magazines. 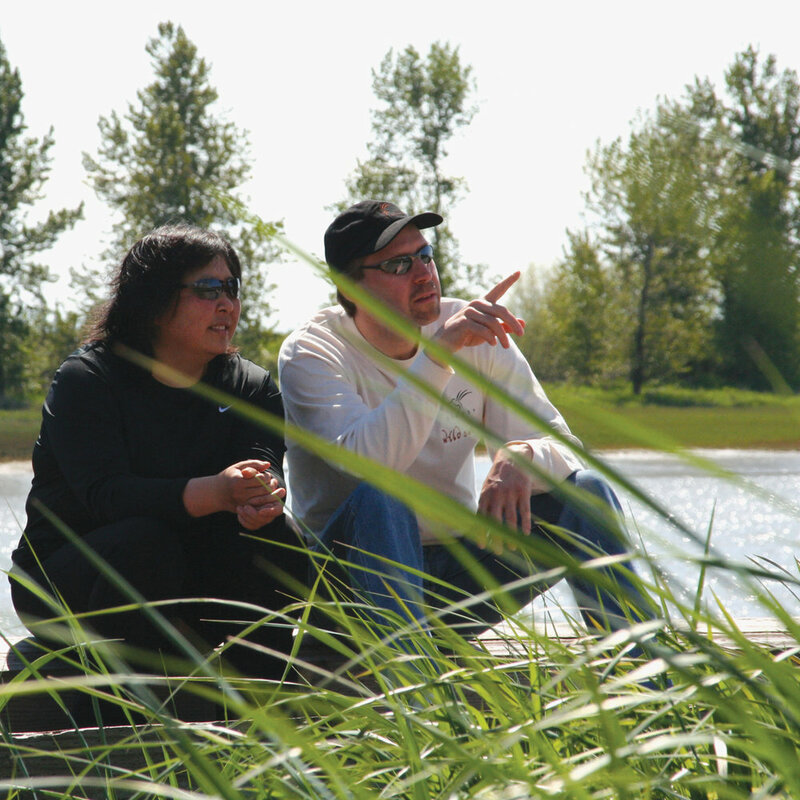 Dominique and Cindy Duby are award-winning authors of five cookbooks to date. Wild Sweets: Exotic Dessert and Wine Pairings, won Best Book in the World for Food and Wine Matching (2003) while Wild Sweets Chocolate won Best Chocolate Book in the World (2007) at the Gourmand World Cookbook Awards in Spain and Britain. Both books have a foreword by Charlie Trotter. In 2008, they launched a new series of books titled Definitive Kitchen Classics. 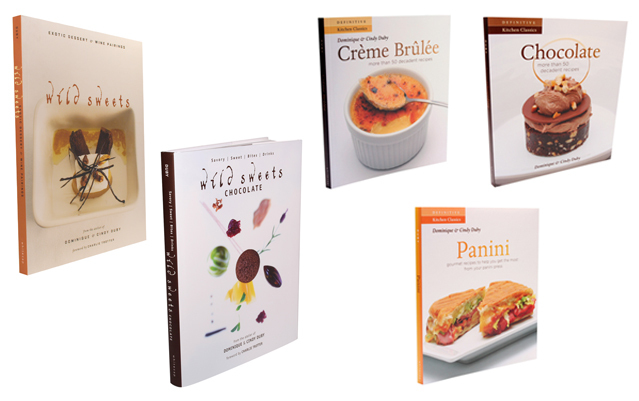 To date, three books in the series have been released: Crème Brûlée, Chocolate, and Panini. The Dubys artistic flair and creative ideas brought them invitations to prestigious international events, along side Michelin 3-stars and world culinary icons, such as the Master of Food & Wine, World Gourmet Summit, SOBE Wine & Food Festival to name but a few. Wild Sweets® By Dominique & Cindy Duby is featured regularly in the media, and past / present outlets include NBC Today Show, The Food Network, National Post, The Globe and Mail, CNN American Morning, and many more.